Automated car technology is on a roll, and rather literally at that. But for all of the stunning advances we've seen lately from the likes of Waymo, all automated cars and self-driving taxis essentially remain firmly in the testing phase. But Uber CEO Dara Khosrowshahi doesn't think that will be the case for much longer. During an interview for Bloomberg's The Year Ahead event today, Khosrowshahi expressed his belief that we'll see Uber automated cars on the road for use by the public outside of testing in as few as 18 months. But don't expect that the ability to make a bit of extra cash as an Uber driver is going to vanish quickly. Khosrowshahi explains that in 95% of cases during the first few months the feature is publicly available, Uber may not have the roads fully mapped out in say, Phoenix, where Uber is currently doing some of its testing. In the vast majority of cases, Uber will initially send out human drivers. Still, there will be around 5% of cases in which an automated Uber car is perfectly suited to the task, and so the company will send one along rather than a human driver. 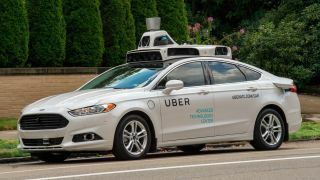 The rider will have the choice of having a human or an automated driver pick them up, though, and even if the car can handle the route, Uber may still send a human driver if the weather is unfavorable. In time, though, Uber hopes to bump that humble 5% up to 10%, 20% and so forth. Within five years, Khosrowshahi says, "We will have the perfect driver in Phoenix." This is only for Phoenix, though. Uber will have to repeat this process for every city it operates out of, and Khosrowshahi estimates that it will take around 10 to 15 years to get most of those cities compatible with its automated tech.